Would you like to make your own special coffee as French press or espresso? Our electric coffee grinder helps you get different coarseness of coffee beans as well as dry and brittle food like spices and nuts, etc. Fresh grounding beans provides the best taste of coffee, so it is a perfect gift for coffee lovers. 1. Place the coffee grinder on a flat surface. 2. Pour coffee beans (LESS than 60 g) into the grinding chamber. 3. Press the on/off button and hold the lid on tight while the coffee is being ground. 4. View the consistency of coffee grounds from the transparent cover. 5. Once the desired grind has been obtained, unplug the power cord from the outlet. 6. Remove the transparent cover, pour out the coffee ground directly (Empty the grinding chamber with the brush). 1.Be sure to unplug this appliance before cleaning. To protect against electrical shock, do not immerse cord, plug or motor base in water or liquid. After each use, ensure the plug has been removed from a wall outlet. 2.Never immerse the motor base or fill water into the grinding chamber for cleaning. 3.Wash the cover with water and mild detergent. The cover is not dishwasher-safe. Rinse it thoroughly and dry it. 4.Wipe and dry the grinding chamber and blades with a lint-free cloth. Be careful of the sharp blades. 1.Do not operate this appliance continuously for more than 1 minute. Cool down the appliance for 3 minutes before next use. 2.This grinder can only grind dry and brittle foods. It is not allowed to grind anything moist, extremely hard, or gummy (such as whole ginger, chocolate, or sesame seeds) or oily spices (such as cinnamon, cloves or nutmeg). 【MULTIFUNCTIONAL COFFEE GRINDER】This conical burr grinder uses 301 Stainless Steel Grinding Blades which is sharp, tough and hard enough to decide the coarseness of coffee beans or other dry spice and nuts. No matter French press coffee, or espresso, this grinder would help you get the ideal coffee coarseness. 【QUICK AND QUIET】One-touch Operation. 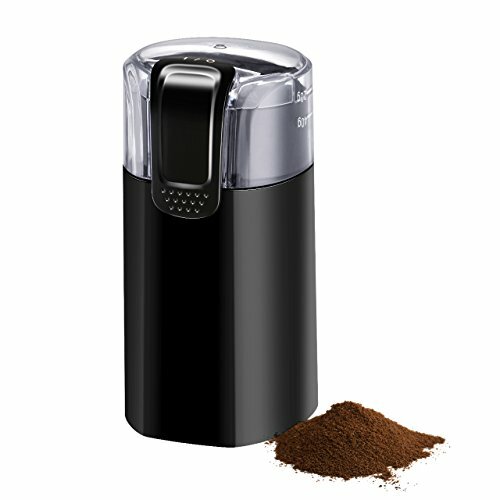 This coffee grinder is quite easy to operate even by one hand, you can get the desired powder coarseness within 1 minute. So fast to make your morning more effortless. The motor is upgrade noiseless, it is quieter than other coffee mills. 【REMOVABLE TRANSPARENT COVER】You can observe the grinding process through the transparent cover which is removable and can be immersed in water for cleaning. Blade Grinder can decide the different coarseness within different time. 【EASY TO CLEAN AND STORE】Use wet cloth or the included cleaning brush to clean the powder remaining in the coffee grinder. It' s easy to store or transport and save your space of the kitchen table with the SPECIAL STORAGE GROOVE design in the bottom. 【PORTABLE AND COMPACT】The Dimension of this electric coffee grinder is 3.82*3.46*6.69In, which is compact and portable. 2.1oz Capacity. Yields up to 12 cups of Coffee. Atmoko Coffee Grinder has 18-Month worry-free Warranty and 45-Day money back Guarantee. If you have any questions about this product by Atmoko, contact us by completing and submitting the form below. If you are looking for a specif part number, please include it with your message.